Creating flavour isn’t a one-step process, it has to be built, retained and adjusted as you make the dish. And that can seem a complex task, but using Knorr Chicken Stock Range. 1. Use Knorr Chicken Stock Powder as a marinade base for your chicken. It’ll bring out a natural, juicy flavour. 2. Cook your rice in a stock made from Knorr Chicken Stock Cubes. It’s authentic, meaty taste takes rice from bland to flavoursome, and brings back the intense chicken flavour. 3. Flavours can change when exposed to heat. Finishing off your dish with a sprinkling of Knorr Chicken Stock Powder restores balance to the dish and gives it a final flavour lift. Chef’s tip: Salt may be your seasoning go-to, but in terms of depth of flavour, it doesn’t bring much to the table. 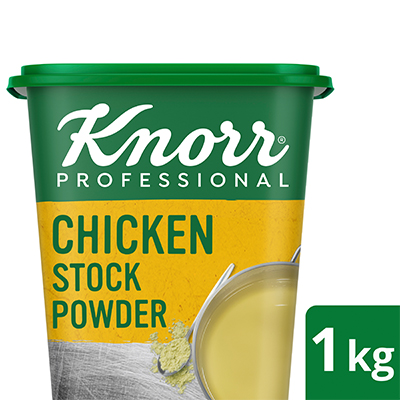 With Knorr Chicken Stock Powder, flavours are enhanced without the risk of overpowering other ingredients, giving you an intensely flavoursome dish.